Sardinians greet each other by saying, A kent’annos—“May you live to be a hundred.” In fact, Sardinians are twice as likely to become centenarians than other populations. Could the answer be Sardinia’s Slow Food-style cooking? Its heart-healthy red wine? The outdoor exercise that comes with shepherding? A visit to this Mediterranean island—where people treat food with sacred respect—reveals the secrets of longevity. Blessed by rugged limestone mountains that rise from the dramatic turquoise sea, Sardinia’s pristine beauty makes it one of the Mediterranean’s most exotic islands. 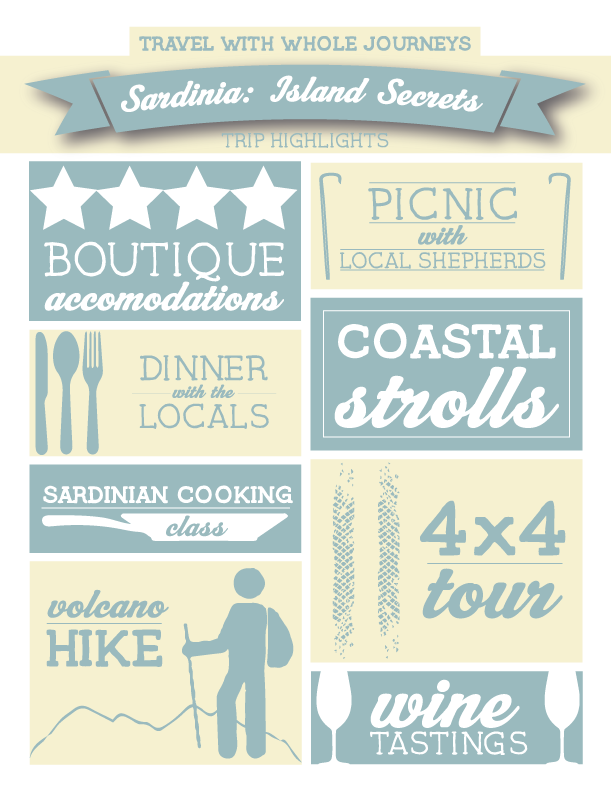 Just 120 miles west of mainland Italy, Sardinia seems a world away, thanks to a strong cultural identity. Sardinians speak Sardo, the closest existing language to Latin. This primarily rural island still maintains its age-old traditions, including a unique singing style, canto a tenores, practiced by shepherds for 3,000 years. It’s still performed by quartets of men in pastures and villages. In Sardinia, food is sacred—an ancestral way of gathering the community. In many villages, locals still bake their own bread, following centuries-old recipes. It’s possible that Sardinia was one of Europe’s first winemaking regions—and this island is the Italian region with the largest number of local grapes. We’ll meet mid-afternoon in at Cagliari before enjoying anairport (around 3 pm, depending o flights) and catch a shuttle to our first hotel. After you check into your room, we’ll reassemble and take an early evening urban walk through beautiful Cagliari, the capital of Sardinia, called in Sardinian language “Casteddu” (the Castle), because of its fortified district overlooking the sea., Twhere we’re welcomed with a refreshing glass of Vermentino, the most famous of Sardinian white wines, overlooking the bay from the coolest terrace in town. Next, we’ll head to ill the Sinis area, a peninsula that overlooks the west coast, characterized by wetlands inhabitatedinhabited by pink flamingoes, and shining white beaches. The main village is Cabras, isa laid back very laid back place that reminds of Mexico, with a long tradition of lagoon fishing. The town hosts some of the couple of the most interesting heritage attractions of Sardinia: the ancient Phoenician settlement of Tharros and the mysterious “Giganti di Monte Prama”, giant sandstone statues representing nuragic warriors dated back 9th BC, even before Greek statues. With the pretty village of Santu Lussurgiu as our home base for two nights, we’ll hike the slopes of Montiferru, a dormant volcano now covered in oak forests and olive groves. We’ll also sample the region’s unique foods, including its famous single-cold-pressed olive oil at the Peddio family mill. In addition, a Sardinian chef will teach a Slow Food cooking class and explain the importance of protecting Sardinia’s traditional cuisine. 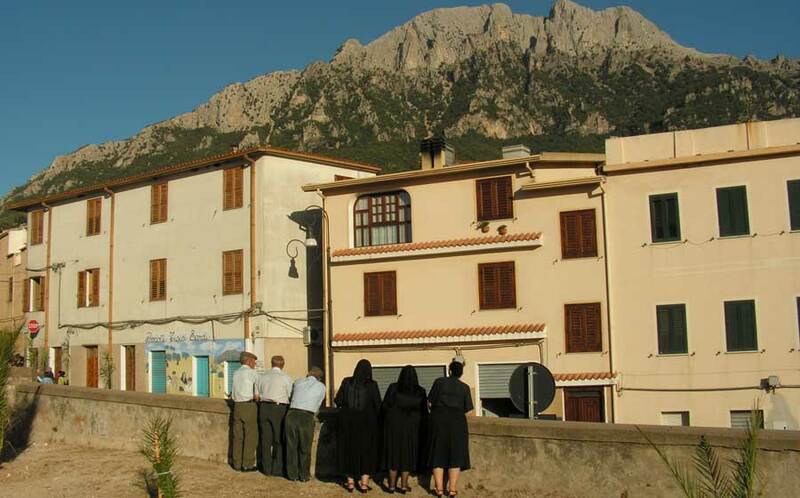 As a special treat, we’ll enjoy a performance of canto a tenores, a quartet of men singing ancient Sardinian harmonies. Leaving the coast, we’ll head inland to witness Sardinia’s prehistoric past, built by Bronze-Age Nuragic people. Among the amazing archaeological remnants of this ancient culture is the sacred-well temple of Santa Cristina. Next, we enter Barbagia—a rugged, isolated region. Fortified by mountains, Barbagia is the heart of Sardinia and home to many of the island’s centenarians. Researchers attribute Sardinians’ longevity to a combination of things: their unique DNA, consumption of antioxidant-rich Cannonau wine, and plenty of walking. For further insight into Sardinia’s traditional culture, we’ll visit a folkloric museum and spend one night at an agriturismo (farmhouse B&B) not far from Oliena village, where we’ll enjoy a superb Barbagia-style meal created from farm-fresh produce. On our 5th day, you have the option between discovering stunning coves on a boat ride along the heavenly gulf of Orosei, or joining local shepherds on their daily stroll and picnic in the Supramonte mountains. The coastal Ogliastra province is easily Italy’s most photogenic region in terms of natural, wild beauty. Enjoy a coastal walk and visit to the Medieval church dating back to around the AD 1000, consecrated to Santa Maria Assunta. According to tradition, the church was built on behalf of a princess of Navarra. The Ogliastra province produces the unique Cannonau wine. We , so next we visit the Moreno house and farm to learn the family secrets for making this rich, heavy red that’s full of heart-protective procyanidins. Other highlights included exploring Bronze Ageruins, sharing lunch at a Sardinian family’s Cannonau vineyard, and strolling through the historic center of Cagliari, a sophisticated Mediterranean city, by night. Depart from Cagliari airport—or stay longer stay in Cagliari with its bustling food markets and the sandy Poetto Beach.